With last night being the coldest in August since records began, my mind has turned to one of my favourite types of clothing: knitwear. I've always loved shopping for knitwear, and my friend Bob would have to drag me away from the knitwear section whenever we went shopping. 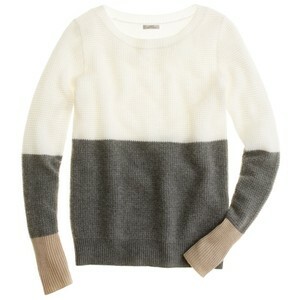 This jumper from J.Crew was sold out by the time I found it - but I've lusted after it ever since. I hate to say it gang, but the autumn's rolling in and this jumper would be the wear-with-everything answer for those chilly moments. It's still available in a blue-green-navy colour combo in the J.Crew sale. But I've since found this version from GAP, which is 100% merino wool and is a nice equivalent. The radish colour-way is also rather fetching, and features burgundy, which is one of the big colours of autumn/winter 2012. And all their knitwear is on 25% off until Sunday. Roll on winter.